Bring colour and fragrance to your garden at different levels this summer by adding elegant climbing plants using a wall trellis. Climbing plants bring a strong vertical element to your garden and make a highly visual impact when trained against walls and buildings. 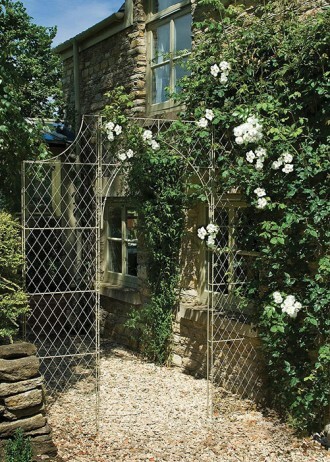 Our sturdy wall trellis panels provide stylish, yet unobtrusive support for climbing plants. Use them to disguise unsightly areas of your garden so your fences, walls and sheds become decorative features covered with blossom and foliage. Which climbing plants with our diamond garden trellis? Our heritage-inspired wall panels have a diamond trellis so that climbers such as clematis, wisteria and honeysuckle have room to twine round the wirework. There’s a clematis for every season and it is such a versatile climber that it can be used in a variety of ways, extending points of interest. Wisterias, too, are beautiful climbers with scented flowers in shades of white, blue, purple and pinks. They are perfect for covering plain, unattractive walls. Unlike a wooden trellis, which will need treating against rot, our light, but strong garden trellis panels provide a low maintenance and durable alternative. You will need to choose a size that will easily accommodate the eventual height and spread of your climbing plant and then once established, your precious climbers can be left undisturbed for years.